Mens Motorbike Motorcycle Leather Suit. Made from 100% real cowhide leather. 1.2 1.3mm Leather thickness. CE Approved Protection inside Shoulder, Elbow and Back. Removable Soft Plate Back Protector. Original YKK zippers on front, knee calf and cuffs and Velcro closure cuffs. Soft comfortable neoprene at collar and cuffs. Foam padding on elbow and knee to reduce crash impact. Leather stretch panel at back and knee for proper riding position. Triple stitched with Nylon thread for maximum safety. High quality Stretch material used on crotch, back of knee and under arms. Elasticated Back Pannel on Trouser for Flexibility of the Rider. 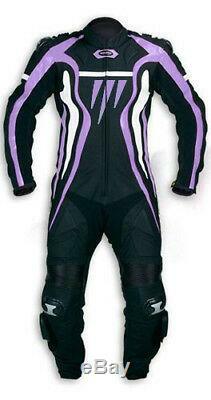 Mesh Lining Having Removeable Protecter Pockets. Please note: there may be a slight shade diff between of the jacket you receive from the pictures - due to photography lightning. Please note: This is a tight fitting Suit, please order accordingly. 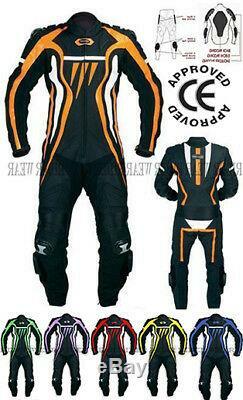 Motorbike Suit Body Measurement Size Chart In CM. Total height Head to Toa. 1: Size can be customized according your requirements. 2: Design can be changed according to your requirement. 3: Ambroidered logo of any design can also be added. 6: Your Name can be added at the back. Note: Additional Charges may Apply. Measure from wrist bone to circumference. Measure at elbow bent to circumference. Measure bicep at your widest round point. Measure your neck round under your front neck bone. Measure From under arm at widest point of the chest. Measure below 5cm from bally button of the waist. Measurement should take at widest point of the hip. Measurement Should be at maximum point of the thigh at crotch. Measurement should be at your bend point. Measure should at the maximum point of the calf. Measurement at your ankle bone around. Measurement from right shoulder bone to left shoulder. Center back neck to waist. Measurement upper back bone to waistline. Measurement elbow bone to wrist bone. Measurement from shoulder bone to wrist bone. Measurement from knee bent to ankle bone. Measurement from waist to ankle bone. Measurement from crotch to inner ankle bone. Measurement from shoulder high point to ankle outer bone. We advise to check our size chart against your measurements when placing order as our sizes could differ from UK size standards. In the unlikely event, if there is a problem with an item please let us know immediately. Please allow us to resolve the problem before leaving feedback or opening a case. 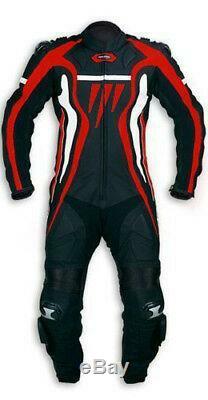 The item "Men, s Motorcycle Motorbike CE Aproved Armour Leather Racing Bikers Suits ONE PCS" is in sale since Saturday, September 15, 2018.